Ever on my Bloodborne kick, I made this creature on vacation for a session that same day. The party was Dennis playing Asura, Chris playing Alan, Matt playing Sael, and two others from our primary group! My friends Caleb playing Kevlier and Megan playing Kieron joined us for the session, bringing a Druid and Paladin to play. I'll probably go into the non-combat details of that session some other time (I tried out some new storytelling techniques), but for now, the boss of that session is here. So, you wanna stat Gods? This is a good start! Ebrietas's strategy for attacking is pretty simple. First, cast Crown of Stars. The sooner you cast it, the more mileage you'll get. 4d8 as a bonus action every round is nothing to sneeze at, and her +12 bonus to hit makes it fairly consistent. Next, start using legendary actions for Magic Missile. There were 2 paladins in the party facing Ebrietas, both with high armor class. You can already see where this is going. If you really focus a single person, it can end up somewhere around 30 damage per round. That accelerates to 60 once Ebrietas drops below half hp. After the first round, start blowing other high level spells. Synaptic Static is devastating, dealing psychic damage and producing a pretty negative effect on a failed saving throw (which is intelligence, not a common save). Maelstrom was also excellent. The creek in Ebrietas's lair widened to accompany the Maelstrom's size, and at a 30 ft radius, it was excellent for area denial. Area denial works both ways, of course. That is, until, Ebrietas starts using her "Fly" legendary action. 80 feet of movement easily carried her from one side of the lair to the other. I did end up using Chain lightning, but against my players in particular that was sort of a bad idea. The Rune Spells are a subsystem I designed, the Elsry rune being the most esoteric (on purpose). I used it several times to Halt (the second level variant of the rune) Alan, freezing him in time. Once a character interacted with him however, he was good to go. I think I used Halt all 3 times she was able to cast it, and all on Alan. That’s all that kept her alive for so long, he’s such an absurdly tanky character. This was a beast of a creature; I’m happy with how she worked out. My long suffering page followers were hit with a barrage of COME WATCH MY STREAM posting (and indeed you should) while I played For The King, specifically their Frostbite Mountain adventure. I had a great time, and it scratched my D&D itch to boot. I’ve been thinking over a lot of the items, skills, spells, and in particular status effects. Video games are better equipped to handle a multitude of status effects than your average RPG by far. You have more time to engage with the game than if you were depending on scheduling something out with your friends, the game adjudicates the status effect’s impact on gameplay by way of the developers coding, etc. I’m not that designer. Also, a new status effect is more of a tool specifically for people creating content, seeing as you need some sort of delivery system for a status effect to even come up in the game. When considering what I wanted out of a new status effect, I decided on a damage boost (against the target effected). Frozen: The target is vulnerable to the next damage it takes. There’s a few issues with this, but let me hit you with the inspiration. “Frozen” in For The King causes the target to suffer an additional 25% damage. Now, vulnerable obviously deals an additional 100% damage. Frozen in FTK lasts for more turns, but that’s besides the point. I don’t need to duplicate it to the exact. First, the question of Resistances and Immunities. I need to include a small disclaimer of those. I could simply say that it has no effect if the target is immune to the damage type. I could assume the game master is happy to make a target normally resistant take normal damage. Applying vulnerability to a creature normally resistant to an effect isn’t something people normally need to deal with. As a matter of fact, I don’t think that situation has existed even as a possibility until the release of Xanathar’s Guide to Everything, with the addition of the Grave Cleric. Its channel divinity feature makes the creature targeted vulnerable to the next attack against it. Do resistance and vulnerability cancel each other out? I certainly think so, and I’m sure everyone I play with would agree. That’s not quite my standard for placing caveats in my design. If I can clear things up without inflating the word count too much, to me that’s preferable than any unnecessary amount of confusion. The questions Mearls and Crawford in particular have to suffer shows it doesn’t hurt to include some extra clarification. Frozen: The target is vulnerable to the next damage it receives. If the target would normally be resistant to the damage, it instead loses its resistance to that damage. If the target would normally be immune, it takes no damage. Not too bad! We should fix two last things. First, “Frozen” is probably a bad name for the status effect. It’s a port from something else; D&D has a ton of monsters to use. While it makes sense in the context of For the King, there’s no specific relation to ice or frost here. Next, the last sentence on immunity sounds redundant, so we’ll change it up. Weakened: The target is vulnerable to the next damage it receives. If the target would normally be resistant to the damage, it instead loses its resistance to that damage. Targets which are immune to the damage suffer no effect. Now we’re cooking with gas! Weakened makes far more sense when it comes to the effect. I don’t have to worry about any dissonance between the condition’s name and its effect on a creature like Frost Giants or Rhemorazes. This should provide some interesting levers to play with when designing homebrew content. In fact, I have to make a magic bow for Kevin’s new character. Well the poll on my page was clear, and the Charger revision is going back to the drafts for awhile. All's well though, spellcasting is one of my favorite topics when it comes to games in general. Now, I love magic in tabletop RPG's in particular because there's such a variety of actual spells. Far too many they could get a game like sky room, there's just too much programming and development of assets that would go into developing 1/10 of the spells D&D has (that's not including situations that would involve their application, though most are combat focused so it's layered with other things). However if you're like me, you might find spellcasting and D&D a little stale after a while. You're constantly looking up spells that don't have the concentration tag's you can layer some active effects, combats only last three or four rounds, and there's all the spells you can't really justify casting over something else. There may be a situation one in a million where casting wall of sand would aid the party in combat. Perfectly reasonable assumption. However, there will never be a time in which casting wall of sand is a better tactical option than casting haste. So, my first choice for editing spells within D&D is screwing around with the concentration tags. Now, I've already gone into elsewhere what my current system for managing concentration is. For those of you not quite looking to rip off that band-aid yet, no worries, I'm going to try something a little different here that hopefully exposes the process. We're going to run down a 5 step plan for determining whether you can take concentration off a spell without breaking the game. There's plenty of obvious spells to choose from, but I'm going to see if I can't run down a list of more difficult choices (can't grow if you don't challenge yourself). 1. Compare the spell to haste. Haste isn't actually the linchpin here but it's a useful example. Chances are, if you play for a year or more, certain casters have a signature spell. It's the best, the party moves around it, it's the first suggestion someone makes when they want to solve an issue, it's the first thing someone casts in combat. In the game I'm currently playing, literally every player has some sort of martial competence. On top of that, we find ourselves kited often (mostly bosses fleeing from the raging half-orc with two greatsw-ALL HAIL KAINO THE MOUNTAIN) so the speed boost is gravy. Any other concentration spell I cast is weighed against the speed and damage boost 2 or 3 of my party members are receiving at that time, so it's rare that I drop anything else on the field. Spike growth COULD be cool in some situations, but I rarely have the excuse for it. For these reasons, haste is my go-to. 2. Evaluate the opportunity costs of the spell. What happens when a character drops concentration on another spell to cast this one? How does the battlefield change? Is it more valuable to maintain concentration on a hold monster or fog cloud then switch to this one? Will it see any use? If you drop in this instance the concentration tag, does it displace the other spells? Obviously if you remove concentration from the spell they can deploy the effect alongside a concentration effect. Let's say we've got a spell, single target to keep things simple. It doesn't deal any damage but incurs a pretty hefty status affect. Not something that hurts a creature's action economy, just makes it worse that using the actions it has available to it. That spell sounds pretty fun, and it is! It has to pretty hefty downsides though. It offers a saving throw for the effect obviously not bad enough itself, and that save is Constitution based. Monsters tend to be decent at Constitution and strength saving throws. Next, the spell offers a repeating save. The spell can fail well before it would naturally end or even before you take damage and may be feel concentration check, even if the spell originally succeeds. For arguments sake, let's make the spell second level quite a few second level spells match the sort of design. Now the spell isn't useless by any stretch of the imagination, it's still pretty powerful. Do we add the concentration tag to it? I'd say no! The restrictions placed on the spell are significant, and the spell's benefit isn't something that takes the enemy off the board. It doesn't deal damage, and it has a good chance of failure even if the spell succeeds at first. If you add concentration to this spell, it's not going to be terribly impressive. So unimpressive, that it gets moved from a "nice in-pocket spell" to "right in the never-cast list with wall of sand". So, we do not add the concentration tag to such a spell. If said spell has that tag, we remove it. This spell exists, by the way. It's Blindness/Deafness, and it's great for minibosses and clutch moments when I'm playing a character focused on battlefield control. 3. Compare the spell to other spells of its kind. There's a cluster of 2nd level spells that really overlap in their utility and purpose, mechanically and thematically. Suggestion, Crown of Madness, and Hold Person (that last one might seem odd but I promise it's supposed to be there) all serve to diminish or cut out action economy in some fashion when it comes to the enemy. Are your players going to ignore spells similar to the one you've selected to change? Is that an indication those other spells are in need of a fix as well? Or are you just boosting a spell to be too powerful? 4. Consider any exploits that result from changing it. This step in the process of editing the spell is particularly relevant given the tag have chosen to use as an example. After all, concentration is fifth editions design Band-Aid on too many spell effects. So naturally, making your mechanical change in this area exploit – proof is especially necessary. It's almost like I plan these things. Changes to debuff spells are especially in need of attention. Stacking multiple conditions on top of one another can create a much faster downward spiral for your monsters. Creature fails wisdom save, creature has a condition that makes it automatically fail dex and strength saves, casters start throwing those spells at the creature, tensions rise, the DM flips the table. Avoid this. Don't engage in theory crafting; honestly think about how your usual combats play out. Mine tend to go about 3-4 rounds, and the players tend to get surprised more often than they do the monsters. I wouldn't think about what would happen if the cleric had 6 rounds of not taking damage, total preparation, no restrictions on line of sight, no risk of the monsters overwhelming him, etc. That situation will never play itself out in the game, not even by accident. Does the caster become a higher value target for intelligent monsters? Does the caster somehow make themselves more difficult to hit or take damage with the spell? Do the effective damage reductions also restrict their ability to affect the battlefield? Play out the situations in your head, or just take some 1" grid paper and literally play out the situation on paper. Not enough DMs do this, in can seriously benefit your design decisions. 5. Evaluate whether toning down the spell may be worth the tradeoff. There are two easy ways to tone down spells that are normally concentration. First, add a repeating save. There are few concentration spells that last for something like a minute and do not offer a repeating save. Spells of these sorts are usually justified in having the concentration tag. You might want to remove it anyways for whatever reason, so a good way to tone it down is to inflate the chance of the spell's failure. Pretty simple, right? Now some spells have a one minute duration and already offer a repeating save. If you want to remove the concentration tag from that spell, your easiest option for diminishing the effect is hard capping the duration. Make the spell last until the end of the casters next turn. It's a hefty penalty, but it's a nice trade-off. Now, what if you've encountered a spell that already caps the effect at the end of the casters next turn and has the concentration tag? More likely than not, you found a poorly designed spell. But if some miracle such as spell exists and deleting the concentration tag would make it unbalanced, simply increase the minimum level at which it must be cast. In fact, that change is relatively easy to institute to begin with and perhaps easier to remember. This stage of the process is what I'd most recommend consulting with your players. As the adage goes, if it ain't broke don't fix it. After going through the previous steps, you may find a proposed mechanical change is best in your eyes balanced by diminishing some aspect of the spell. There are a variety of ways to do this of course, but I'd like to note that this step of the process is most likely to step on your players toes. Now, don't try to avoid that while going through this process up until this point. You would to plunge yourself into the mechanics, the math, the way your change plays out of the table. This plenty of opportunities for somebody to be mildly inconvenienced by a change you made; you need to ignore those thoughts while testing things out, or a else slow (worse yet, stall) your progress. Once you get to this point, feedback is helpful! Making the design process collaborative for this sort of thing in the early stages can be difficult. It's far too easy to shoot each other down before getting things on paper. And since prototyping mechanic for a tabletop game is noticeably easier than prototyping for something like a videogame, the potential payoff for ignoring everyone else to get the idea established is far too high to resist. So, ask your players! Ask whether this will step on any of their toes! They will be best equipped to see if this will have any immediate or obvious detriments to their enjoyment of the game. Note: Sorry for a lower quality here, I had a really excellent 2-5 point list buy didn't save changes, so a lot of this is re-hashing things I'd already written down. This week's statblock is a little different in that I actually already attacked the players with it. Besides that, This is more of a "homebrewed on the spot" monster (I had a bit of help from the 3.5 Sandstorm supplement). Nasty, huh? This is how solo bosses should be made! Let's go through it. The players met God-King Orion (which I stole shamelessly from warhammer), who pledged to give them access to a Rune if they pledged themselves to a Hunting Lodge of his tree-city. How does on pledge to a lodge? They agree to go on a hunt, the target of which is chosen by Orion. The players accept, Orion thinks awhile, and he decides on what he wants. "On another world lies worms of titanic size; hunts worthy of my Glade Riders! One's caught my eye; Albino, with the breath of a dragon, and scaled! My Riders will guide you through the Glade, and drive the creature towards you." This plays out, the players make it to this new world (which they didn't at first understand, was not a plane, but another Material World), and look about. Pale red skies and sand lie above whatever ravine or canyon they've landed in, and the Riders set out to drive the worm towards them. Important note; the players knew the Riders were not to assist them in the event things went sideways. This sort of encounter (the players are specifically contracted to fight it) is a great opportunity to be nastier than usual. So, let's evaluate what this guy can do. The big threat to players is the Cold Breath. It's based on a Con save and deals a slightly less common resistance. The Gusting Breath is functionally more deadly to the players. It's based on a slightly better save for players (though not for mine in particular), but deals a far less common resistance (physical damage) and has the potential to blind the players besides. That being said, it can only be used after using the Inhaling Breath. This of course means using its action a whole round beforehand, which minimizes its damage somewhat. Not by too much, though. The Inhaling Breath is actually quite useful on its own; bringing creatures closer to its lovely whirlwind of death is frightening on its own, particularly if you start using the Bull Rush legendary action. Let's go to the Molting Shriek ability. I detected pretty early on the players were going to attempt a stunlock (and why not, there's only 1 creature). Once we got to a point in the fight that the players discovered holding back might get one or more of them killed, the creature's hp started dropping far more rapidly than before. 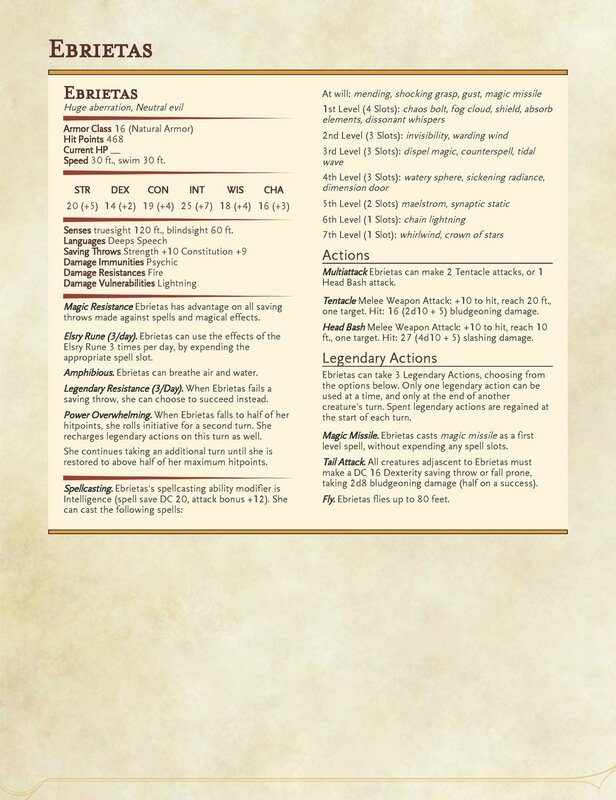 I decided to give it a reaction (homebrew monster, I can do what I waaaaaaaant). I didn't know the specifics of the reaction beyond 2 things; it dropped his AC by 2, and the players had to make a con save or become stunned. I remember describing it as rearing back in pain, inhaling to emit the shriek so strongly that some of the scales and chitin they'd been striking began to slough off. If I recall correctly, this was roughly around where the creature was at half hp. Half HP is generally a goof flux point to intensify a battle, whether the creature gets stronger, weaker, or whatever else have you. I used this ability a second time however, when he was at something like 20 hp. I didn't have to include a justification for using the ability multiple times, of course. What I invent in the moment isn't always necessarily useful to anyone reading. Nevertheless, I thought I might be able to come up with a clever escalation mechanic, and lo! I did! You might be wondering "Why doesn't the worm just spam that ability, use legendary actions and breath weapons to kill the pcs, and bounce?" 2 reasons, one of which is tactical, and one of which is not. The tactical reason is spamming Molting Shriek grants diminishing returns. The chances that all of your players will fail the save (even as hefty as 16 Con) is low. The chance they'll all fail it multiple times? Virtually none. So your monster is very rapidly decreasing his armor class (which normally remains static). 5e math is adjusted for players hitting something like 60% of the time. That might be lower when it comes to high AC creatures like this. If the monster spams this ability, he'll be hit with far more attacks and be far less able to defend himself. His HP will begin to spiral downwards; the difference between HP retention in the fight between my players and this creature before and after he used Molting Shriek was very, VERY distinct. That's just going from 20 to 18. Imagine going down to something like 12! You might very well kill a player, don't get me wrong. You're probably not going to get much more than that, though. I saved the narrative reason for last because I wanted a well thought out, mechanical explanation for the inevitable complaint over things people haven't playtested being "OP". Narrative reasons are nice, but people will glance over them if they dislike the conclusion. There's a very simple reason this creature doesn't do take "tactically completely optimal" option: it has an intelligence of 6. 6! There are no tactics for that creature. It's not going for the spellcaster first. Stop it. Stop typ-no, stop. If you wanna play the half dragon sandworm like it houses the trapped consciousness of Alexander the Great, you do you man. One last thing; the death burst! This was I think lifted directly from the 3.5 supplement. Very simple ability; the players kill the creature, and the creature detonates and hurts them. This can actually be important in 2 contexts. For one thing, if other creatures are on the way, how many resources (HP, spells) the players have left is actually quite important. Next, if any players are unconscious (particularly more than one), stay in initiative (which I did). The players probably won't lose anyone to failed death saves outside of combat. The possibility remains, however, and who has what spells to revive someone actually matters (at the very least, a non healer might need to spend some health potions to ensure the survival of a close downed player). Lemme know what you think guys! The players have crafted a cool magic item and discovered new runes in the last session, as well as discovered a bit more about the world they live in. These are things I'd tell you in a campaign diary, but the campaign diaries are supposed to provide 2 things: useful DM material/inspiration, and an enetertaining story. I can't justify cutting down the videos to tell you the "only useful" parts when those are generally best saved for a specific concept. Seeing as though I'm not that great of a storyteller in the context of D&D yet, that means the videos' primary functions aren't being fulfilled. That's fine though, I have this as a creative outlet and I can always go back to videos (which will then be linked here) should I decide that content will be sufficiently useful and worth my time to make it such. Seeing as that's out of the way, let's get to the meat of the matter. I've given my players a lot of sandbox style freedom in their general directions, goals, what they want to seek out, etc. I did start wondering about why they were sent down here in the first place, though. For those of you catching up, my players are exploring the southern reaches of this continent, seeking lost magic items, civilizations, magical power and spells, etc. The reason? The Second Host War has just kicked off, and the nation acting as their patron would very much like to gain any advantage they can at minimal expenditure of resources. A small expedition of adventurers fits that bill, particularly if they start to succeed (and indeed they have). So the players are feeling that success, right? Well, not quite. They definitely love finding new stuff, making magic items, the works. I focus a lot on what I think 5e is missing (somewhat intentionally); loot! In coming to this new region though, they're actually the underdogs in some sense. The party has fought quite a few enemies at this point that have access to Runes they didn't (or still don't). Finding said runes has boosted their power to be more on par with the things they're assaulting, not to gain an advantage over creatures that have no such thing. That's fine! They love the "we get beaten down to come back better" style of play. I still can't help but wonder if it's a bit of dissonance in the narrative. They have managed to transfer Runes to their civilization by way of the high-level druid that contracted them in the first place, despite now being the lateral distance of the United States away through use of certain spells. So here's where I come to my plan for next session; I specifically kicked off the Second Host War so the players would have their punching bag and I'd have a ready supply of "it's ok to wipe the floor with them" villains. Runes are being transmitted and learned back home, but not terribly quickly, and there's no reason to think the Brestrels (antagonist nation) have them yet. What if Ulfin requests their help back home? He can cast a spell, have them there to assist, then bamf them back to their original quest. If the players agree, I know exactly what to prep, what I can expect from the players, who the bad guys are, etc. That session will effectively be on rails, but only because the players chose to put themselves on in the first place. After what I consider to be the failure of my first campaign, I no longer worry all that much about "railroading" but I still have the occasional nagging voice, telling me how terrible I must be as a storyteller for having a real, prepared narrative. The effect I'm hoping to have on the players is demonstrating how dominant their advantage back home would be (and here, is). This is their opportunity to power trip. I'm not saying I'll make the combat easy per se, just adjust hitpoints and such so the volume of enemies they can take on with this advantage is reasonably inflated. As for the premise of the mission? A vanguard force pushed too deep into an Argonne-style forest, found themselves surrounded, and now it's rescue time. Time for this week's weekend statblock, the first I'm placing on the blog. To give my readers here a bit of extra juice I'm going to go a bit in-depth on why I made the creature, how I made the creature, and how I think it'll perform. I added two stat blocks here just to save paper and have on hand. So! For the why: my players as you'll find out in the next campaign diary fled from the coastal village amidst an assault by watery creatures. The large pit billowing smoke that can be seen for miles was not there first stop after the village, but it was what they stuck with. First thing they encountered and this was the fight that ended the night were two beholder-kin: Death Kisses. Pretty nasty fight for a six level party. Nevertheless, I thought about how cool it would be if this place was the layer of a fire themed beholder. Crazy right! Anyways, want to give him some minions that would be both useful as trash mobs in a boss fight and function as nasty encounters in their own right. I'm not going to mention what fire Giants will be doing so far down south in my setting, just know for now that they are very much not supposed to be here. So, what would fire Giants twisted by the experiments of a mad beholder look like? These guys! Meaty and mindless was the goal of this particular creation and I'm pretty sure I was spot on. These guys have a lot of hard-hitting abilities but low enough mental stats that I can justify playing them in sub optimal ways should the need arise to further the narrative. They have a low armor class to make up for their high hit points and immunity to fire damage. 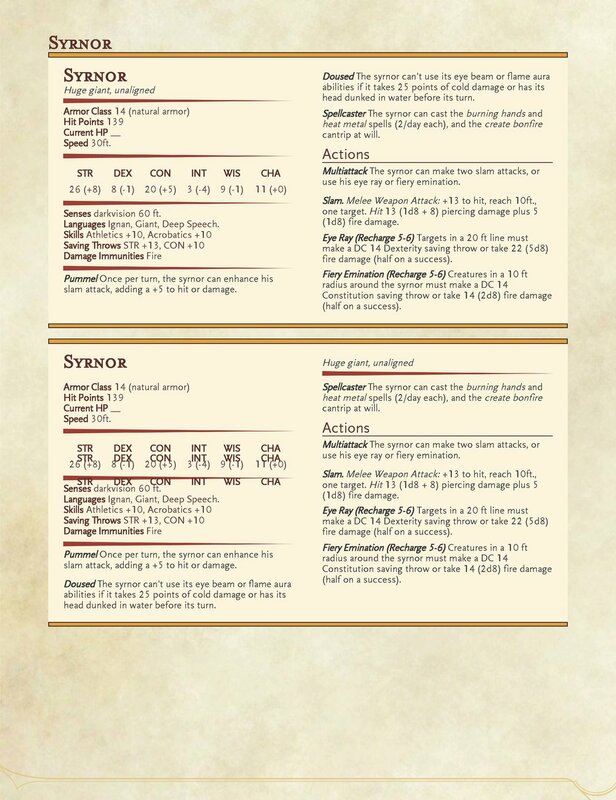 There are at least three people in my party who have the "lower your hit chance, boost your damage" feats of 5E, so this is tuned to them (much like most of what I put out). Sael shouldn't have too many issues seeing as though he's a storm sorcerer (as much as he likes using fire damage). I also like implementing various conditionals; fire drying can arbitrarily boost his damage or to hit chance but only once per turn, and if the players output enough damage of a certain type or engage in some creative spellcasting, they can take these guys down a peg out of the gate. Something I thought of while I was writing this is Sael just hit sixth level, which means he has access to and ability that allows him to create rain within a 20 foot radius. I did write on this sheet that the head needs to be dunked specifically, and I don't I'm splitting hairs when I differentiate that and simple rainfall. At least, I hope I'm not.Also, I noticed I didn't include a save DC for the spellcasting portion or what ability score it relied on. 13, relies on charisma should be fine for a regular if not for the fact a lot of giants use constitution(?) though I may be thinking of other creatures. 18 seems hefty for what these guys can do, but they're also only 1st and 2nd level spells. The slam attacks and the eye beam are the real stars of the show. Other than all that I don't think these guys have any particular sway against my party, they're just generic meaty fire dudes with some cool abilities. Should be fun!